glass,oil,kerosene,lamp,font,fount,wall,bracket,hanging These BRASS shade ring holders are much more costly than tripods, but vastly more secure. The arms are fastened to the outer brass shade ring with solder and therefore cannot flex, as tripod arms do. The entire bottom of the glass shade slips into the edged brass ring. This means that the shade, if bumped, will not slide off the lamp. With a tripod, the shade totters on the ends of the three arms. And finally, the shade ring holder elevates the bottom of the shade so that one need not remove the shade to light the lamp - plus the entire assembly really dresses up the lamp. 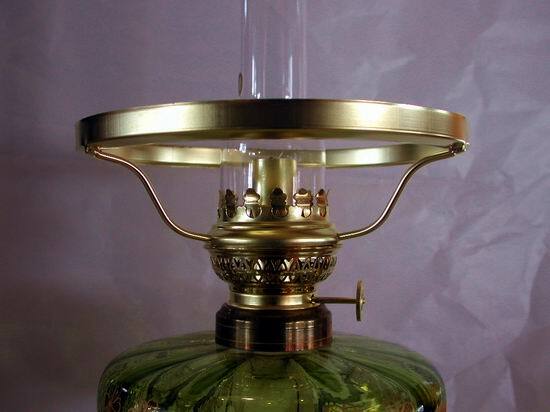 The seven inch size is standard for oil lamps having Kosmos #14 burners - those with flat 65 mm (2-9/16") wicks that the burner furls into a tube. . If your lamp already has a burner and fits at chimney with a 53 mm(2-1/8") base, this is the recommended shade ring holder. This shade holder will also fit the Kosmos #10 and Kosmos #12 burners, resting securely on the burner's rim rather than grasping the burner body as it does with the Kosmos 14. My recommendation is to tack the holder's lower ring to the burner with a spot or two of solder or epoxy that would ensure its stability. Price is $31.39 + shipping by Priority Mail ($9.30 or less).